TBOX is smart SMS for your smartphone that helps you create clean and organized SMS inbox by providing features like spam blocker, auto archive and smart labels! They are now giving away freecharge coupons which you can get by referring your friends to download this free recharge app. 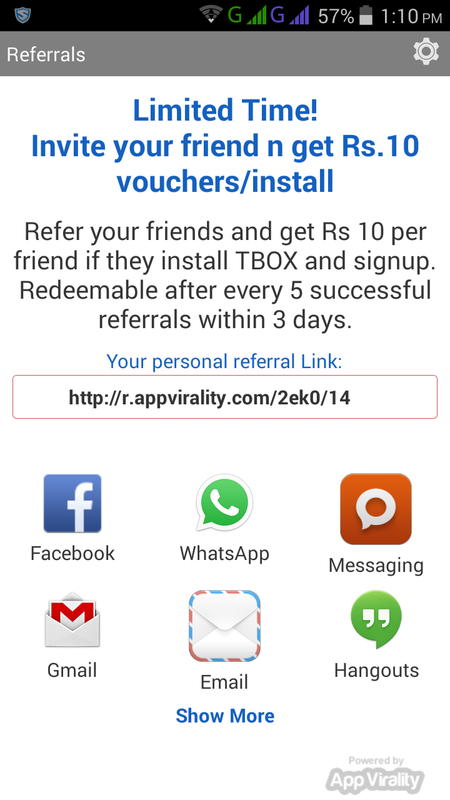 You can redeem your Freecharge promo code when you refer 5 friends. Per referral you will get free Rs. 10 and when it reaches to Rs. 50 you will get freecharge coupon code after 3 days. Now after downloading and installing Tbox App, click on Agree. Then on next page you need to verify your mobile number. After verification it will open the app and shows all your inbox messages there. Now click on upper right corner and then click on Invite and win. There you will find your own referral link. Share it with your friends and earn Rs. 10 per refer. Freecharge Coupon code can be redeemable after every 5 successful referrals. Click on upper right corner. Then click on Invite and win. Then again click on upper right corner (setting button). There you will find your earning.